Air-sea rescue (ASR or A/SR, also known as sea-air rescue) is the coordinated search and rescue (SAR) of the survivors of emergency water landings as well as people who have survived the loss of their seagoing vessel. ASR can involve a wide variety of resources including seaplanes, helicopters, submarines, rescue boats and ships. Specialized equipment and techniques have been developed. Military and civilian units can perform air-sea rescue. Air-sea rescue operations carried out during war have saved valuable trained and experienced airmen. Moreover, the knowledge that such operations are being carried out greatly enhanced the morale of the combat aircrew faced not only with the expected hostile reaction of the enemy but with the possible danger of aircraft malfunction during long overwater flights. The PBY Catalina was one of the most popular flying boats used for air-sea rescue. Air-sea rescue by flying boat or floatplane was the first method used to pick up aviators or sailors who were struggling in the water. Any other aircraft design had the additional danger of ditching in the water and requiring immediate rescue, but seaplanes could land on the water in an emergency and wait for rescue. Long range, endurance, and the ability to stay on station for long periods of time were seen as essential to naval aviation requirements for rescue aircraft. Robust radio equipment was necessary for contact with land and ocean surface forces. Training and weather accidents could require an aircrew to be rescued, and seaplanes were occasionally used for that purpose. The limitation was that if the water's surface were too rough, the aircraft would not be able to land. The most that could be done was to drop emergency supplies to the survivors, or to signal surface ships or rescue boats to guide them to the correct location. An early air-sea rescue was performed in August 1911 by Hugh Robinson who landed his Curtiss Aeroplane Company seaplane on Lake Michigan to pull a crashed pilot out of the water. Dedicated air-sea rescue units were not organized by any nation until the end of World War I. Some rescues were performed, however, by individuals and groups acting on their own initiative, such as the United States Navy Reserve pilot Ensign Charles Hammann who, during the Adriatic Campaign, rescued a fellow aviator adrift in the Adriatic Sea by landing on the water in his seaplane. When the Marine Craft Section of the newly formed RAF, was formed in 1918, it inherited over 200 operational vessels, from the RNAS. These boats were regarded primarily as seaplane tenders, being primarily tasked with the movement of cargo, munitions and crew from the land to the seaplane. Although the launches and pinnaces were equipped for rescue purposes, they were hindered in this role by the fact that they were hard pressed to make 10 knots (19 kilometres per hour) and were in a bad state of disrepair following their war service. The poor navigation skills of the postwar crews also restricted the scope of operations to a purely inshore one. T. E. Lawrence, better known as Lawrence of Arabia, joined the RAF in 1929, working at the flying boat station, Mount Batten in Plymouth Sound. He witnessed first-hand the deficiencies in the rescue system when a seaplane tender, despatched to save the survivors of an airplane crash in the Solent, arrived too late to save them before they drowned. He immediately began to press his commanding officer for the introduction of fast motorboat launches as rescue boats. Lawrence had experience using this type of vessel, having assisted with the 1929 Schneider Trophy race while at the helm of a Biscayne Baby, a fast boat when the temperamental engines were running. Meanwhile, Hubert Scott-Paine, the designer of the record breaking Miss Britain III and Miss England boats and founder of the British Power Boat Company (BPBC), made a similar offer of his expertise to the RAF and he soon began to collaborate with Lawrence in the development of 40 ft (12.2 m) long high-speed launches, purpose-built for sea rescue. The Type Two 63 ft High-speed launch, designed by Hubert Scott-Paine in 1937. The result, built by the BPBC, was the 200-Class Seaplane tender; powered by two 100 HP engines it had a top speed of over 36 knots. Testing on the launch continued from 1931-32 to ensure that the engines could run at sustained high speeds. The ship was an operational success and was followed up with the MkI and MkIA tenders, powered with Perkins Engines. These formed the mainstay of the Marine Section's rescue launches all the way through to the Second World War. Nine of these boats were ordered for use by the RAF Marine service by 1932. In 1935, larger 37 ft (11.3 m) boats were also ordered; these were fitted with wireless systems that allowed the launch to communicate with the Station and the search aircraft, allowing for an efficient system of contact to be maintained. The Type Two 63 ft HSL was designed in 1937 by Hubert Scott-Paine; 63 foot long and known as the Whaleback from the distinctive curve to its deck. This was the main high speed launch class ship used during the Second World War and was instrumental in the rescue of Allied aircrew from the sea after they were shot down. 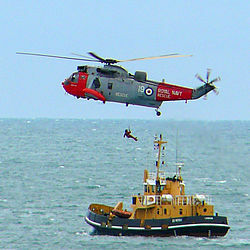 The failure of the Marine Craft Section during the Battle of Britain led to the creation of the Air Sea Rescue Services which with the motto 'the sea shall not have them', was created to coordinate at sea rescue with its own air sea rescue squadrons, Marine Branch and Royal Navy vessels, and Coastal Command flying boats. The principles of coordinating small surface boat rescue efforts with direction and assistance from air units were developed in the 1930s in Germany. In 1935, Lieutenant Colonel Konrad Goltz of the German Air Force (Luftwaffe), a supply officer based at the port of Kiel, was given the task of organizing the Seenotdienst (Sea Rescue Service), an air-sea rescue organization focusing on the North Sea and the Baltic Sea. Goltz gained coordination with aircraft units of the Kriegsmarine as well as with civilian lifeboat societies. Early in 1939, with the growing probability of war against Great Britain, the Luftwaffe carried out large-scale rescue exercises over water. Land-based German bombers used for search duties proved inadequate in range, so bomber air bases were constructed along the coast to facilitate an air net over the Baltic and North seas. Following this, the Luftwaffe determined to procure a purpose-built air-sea rescue seaplane, choosing the Heinkel He 59, a twin-engine biplane with pontoons. A total of 14 He 59s were sent to be fitted with first aid equipment, electrically heated sleeping bags, artificial respiration equipment, a floor hatch with a telescoping ladder to reach the water, a hoist, signaling devices, and lockers to hold all the gear. In 1940, the Seenotdienst added bases in Denmark, the Netherlands and France. The Heinkel He 59s were painted white in June, with red crosses to indicate emergency services. A few French seaplanes were modified for rescue and attached to the organization. In response to the heavy toll of German air action against Great Britain, Adolf Galland recommended that German pilots in trouble over the ocean make an emergency water landing in their aircraft instead of bailing out and parachuting down. The aircraft each carried an inflatable rubber raft which would help the airmen avoid hypothermia from continued immersion in the cold water, and increase the time available for rescue. British fighters such the Supermarine Spitfire and the Hawker Hurricane did not carry inflatable rafts, only lifejackets which were little help against the cold. HSL 130 picking up a RAF Halifax crew off the Isle of Wight, 1942. In July 1940, a white-painted He 59 operating near Deal, Kent was shot down and the crew taken captive because it was sharing the air with 12 Bf 109 fighters and because the British were wary of Luftwaffe aircraft dropping spies and saboteurs. The German pilot's log showed that he had noted the position and direction of British convoys—British officials determined that this constituted military reconnaissance, not rescue work. The Air Ministry issued Bulletin 1254 indicating that all enemy air-sea rescue aircraft were to be destroyed if encountered. Winston Churchill later wrote "We did not recognise this means of rescuing enemy pilots who had been shot down in action, in order that they might come and bomb our civil population again." Germany protested against this order on the grounds that rescue aircraft were part of the Geneva Convention agreement stipulating that belligerents must respect each other's "mobile sanitary formations" such as field ambulances and hospital ships. Churchill argued that rescue aircraft were not anticipated by the treaty, and were not covered. British attacks on He 59s increased. The Seenotdienst ordered the rescue aircraft armed as well as painted in the camouflage scheme of their area of operation. Rescue flights were to be protected by fighter aircraft when possible. 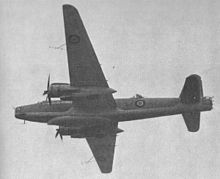 A Vickers Warwick bomber carrying the Uffa Fox-designed airborne lifeboat underneath. Prior to the Second World War, there was still no fully functional coordinated British air-sea rescue organisation for rescuing aircrew from the sea. The aircrew relied on the High Speed Launches (HSL) established at flying boat bases. On 14 January 1941, the first air-sea rescue was set up (the Directorate of Air Sea Rescue Services). The service the aircraft used were diverse. Westland Lysanders were used to scouting the coastlines, while the Supermarine Walrus was planned to be used for long-term use. By June 1941 rescue from the seas had increased to 35 percent. The Air Ministry decided the service could do better. It was merged with another Directorate, Aircraft Safety. On 23 September 1941 Air Marshal John Salmond took over the organisation. In October 1941 No. 275 Squadron RAF and No. 278 Squadron RAF were given to ASR work. This was supported by two squadrons from Coastal Command equipped with Hudsons. No. 16 Group was authorised to create No. 279 Squadron RAF on 24 October to act as a specialised ASR squadron. No. 280 Squadron RAF was created on 28 November 1941 and was given Anson aircraft in place of Hudsons, as they were desperately needed for A/S operations. The British developed the first air-dropped lifeboat; a 32-foot (10 m) wooden canoe-shaped boat designed in 1943 by Uffa Fox was to be dropped by RAF Avro Lancaster heavy bombers for the rescue of aircrew downed in the Channel. The lifeboat was dropped from a height of 700 feet (210 m), and its descent to the water was slowed by six parachutes. It was balanced so that it would right itself if it overturned—all subsequent airborne lifeboats were given this feature. When it hit the water the parachutes were jettisoned and rockets launched 300 ft (90 m) lifelines. Coamings were inflated on the descent to give it self-righting. Fox's airborne lifeboat weighed 1,700 pounds (770 kg) and included two 4-horsepower (3 kW) motors—sufficient to make about 6 knots—augmented by a mast and sails along with an instruction book to teach aircrew the rudiments of sailing. The lifeboats were first carried by Lockheed Hudson aircraft in February 1943. Later, Vickers Warwick bombers carried the Mark II lifeboat. The Fox boats successfully saved downed aircrew as well as glider infantrymen dropped in the water during Operation Market-Garden. The lifeboats carried emergency equipment, a radio, waterproof suits, rations and medical supplies. Aircraft suitability once again came in for discussion during the war. Ansons and Boulton Paul Defiants were not suitable for ASR operations. The Vickers Warwick was earmarked for the main ASR aircraft. 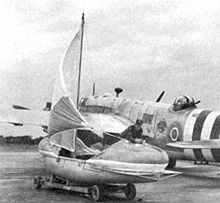 Four 20-aircraft squadrons with specialised ASR conversion were to be made available by the spring, 1943. While development was slow, the effort paid off. In May 1943, 156 men of Bomber Command were rescued from the sea by No. 279 Squadron alone. By the end of 1943 Coastal Command had rescued 1,684 aircrew out of 5,466 presumed to have ditched in the sea. On D-Day, 6 June 1944, 163 aircrew and 60 other personnel were rescued. During the month, June 1944, 355 were saved by ASR units of Coastal Command. In all, 10,663 persons were rescued by Coastal Command in ASR operations. Of this total, 5,721 were Allied aircrew, 277 enemy aircrew, and 4,665 non-aircrew. By the end of the war, British ASR had saved over 13,000 lives and was one of the largest such organisations in the world. Helicopters were first introduced to the role of air-sea rescue in the 1940s. The United States Coast Guard (USCG) was the first agency to evaluate the potential of helicopter rescue assistance, beginning in 1938. USCG Commander William J. Kossler witnessed a helicopter demonstration flight by Igor Sikorsky, flying the Vought-Sikorsky VS-300, equipped with pontoons for water landings and at once saw the advantages of helicopter-equipped search and rescue squadrons. Two early Sikorsky R-4s were acquired in 1941, and training was initiated at Coast Guard Station Brooklyn in New York. In 1942, Royal Air Force and Royal Navy fliers trained in Brooklyn after which the British bought a large number of "hoverflies" from Sikorsky to re-organize 705 Naval Air Squadron. The first hoist lift rescue occurred on November 29, 1945, when a barge ran aground at Penfield Reef, off Fairfield, Connecticut, during heavy weather, very near to the Sikorsky facility in Bridgeport. Sikorsky chief pilot Jimmy Viner, along with USAAF Captain Jack Beighle flew a Sikorsky R-5 (S-48) to lift the two crew members using the hoist and deposit them safely ashore. The first military helicopter air-sea rescue was carried out in 1946 when a Sikorsky S-51 being demonstrated to the U.S. Navy was used in an emergency to pull a downed Navy pilot from the ocean. The first peacetime air-sea rescue squadron exclusively using helicopters was No. 275 Squadron RAF re-organized in 1953 at Linton-on-Ouse. The unit painted their Bristol Sycamore aircraft all yellow, with lettering on the side reading "RESCUE"—a paint scheme that has continued to the present. Helicopters became frequently used, due to a number of advantages; they could fly in rougher weather than fixed-wing aircraft and could deliver injured passengers directly to hospitals or other emergency facilities. Helicopters can hover above the scene of an accident while fixed-wing aircraft must circle, or for seaplanes, land and taxi toward the accident. Helicopters can save those stranded among rocks and reefs, where seaplanes are unable to go. Landing facilities for helicopters can be much smaller and cruder than for fixed-wing aircraft. Additionally, the same helicopter that is capable of air-sea rescue can take part in a wide variety of other operations including those on land. Disadvantages include the loud noise causing difficulties in communicating with the survivors and the strong downdraft that the hovering helicopter creates which increases wind chill danger for already-soaked and hypothermic patients. Helicopters also tend to have limited range and endurance. On the Argentine side, the Fuerza Aerea Argentina used Bell 212 from the islands and the ad-hoc unit Escuadrón Fénix from the mainland. The Ejercito Argentino helicopters, in particular UH-1H, rescued several downed pilots as well, most notable Argentine Naval Aviation Lt Arca by Capt Jorge Svendsen who was decorated with the Valour in Combat Medal for this action. The Chicago Fire Department formed an Air Rescue Helicopter unit in 1965 with two Bell 47Gs at Midway Airport and operated Air Rescue and Sea Rescue as separate units until 1979. Originally based at Midway Airport, CFD Air Rescue operated two Bell 47Gs. Later, the CFD flew a Bell UH-1 "Huey" and a Bell 206L-4. Currently, CFD Air Sea Rescue (ASR) operates two Bell 412EPs, with two pilots and two firefighters working as rescue divers. Additionally, the CFD operates a dive truck "Dive Team 687" and a fast response boat, the "Eugene Blackmon 688." CFD practices tethered, tender-directed dive search patterns, from shore or in-water. CFD ASR responded to 249 water rescue incidents in 2014, and its members logged over 3200 hours of training. In one notable incident from April 18, 2008, CFD ASR members rescued a 3-year-old child who had been submerged in 42 degree water for approximately 15 minutes. After being resuscitated by EMS and at a pediatric trauma center, it was reported in August of that year that the child made a "complete recovery." ^ a b Time, August 6, 1945. "World Battlefronts: Battle of the Seas: The Lovely Dumbos", page 1 Archived 2012-11-04 at the Wayback Machine and page 2. Retrieved on September 6, 2009. ^ a b c d Sutherland, Jon; Canwell, Diane (2010). The RAF Air Sea Rescue Service 1918-1986. Pen AMD Sword. ISBN 184884303-8. ^ "The birth of modern Air-Sea Rescue". Retrieved 2012-12-17. ^ a b "Lawrence of Arabia at R.A.F. Mountbatten, Plymouth". Retrieved 2012-12-17. ^ "Notes on the introduction to the R.A.F. of high-speed craft". Retrieved 2012-12-17. ^ "Royal Air Force Air Sea Rescue & Marine Craft Section". Retrieved 2012-12-17. ^ a b c d e f g h i j Tilford, Earl H., Jr., Captain, USAF. "Seenotdienst: Early Development of Air-Sea Rescue", Air University Review, January–February 1977. Retrieved on September 8, 2009. ^ Ashworth 1992, pp. 170-173. ^ Strahan, 1998, p. 193. ^ a b RAF Davidstow Moor. February 1943: The Airborne Lifeboat Archived 2013-01-16 at the Wayback Machine. Retrieved on September 11, 2009. ^ "Ship Mark II Airborne Lifeboat British (MAR 566)". Iwm.org.uk. Retrieved 2014-05-20. ^ Ashworth 1992, p. 174. ^ Ashworth 1992, pp. 176-177. ^ Helis.com, Helicopter history site. US Coast Guard, part 1, part 2, Retrieved on September 7, 2009. ^ "Sikorsky Products History, Civilian Rescue". Sikorsky Archives. Retrieved September 7, 2018. ^ a b National Museum of the US Air Force. Fact Sheets. Boeing SB-29 Archived 2012-10-09 at the Wayback Machine Retrieved on September 6, 2009. ^ "Fuerza Aérea Argentina". Faa.mil.ar. Archived from the original on 2014-05-20. Retrieved 2014-05-20. ^ "Escuadrón Fénix | Veteranos de Guerra". Escuadronfenix.org.ar. Retrieved 2014-05-20. ^ "3ra. Escuadrilla Aeronaval de Caza y Ataque | Malvinas | Malvinas". Institutoaeronaval.org. Archived from the original on 2015-05-31. Retrieved 2014-05-20. ^ "Sitio Oficial del Ejército Argentino". Ejercito.mil.ar. Retrieved 2014-05-20. ^ Goldin, Jon. Airborne Law Enforcement Association. Air Beat, July–August 2006. "NYPD's Air Sea Rescue Teams". Archived 2008-07-25 at the Wayback Machine Retrieved on September 9, 2009. ^ "HAI Announces 2009 Eurocopter Golden Hour Award Recipient". aero-news.net. Retrieved 27 April 2015. ^ "Great Lake Saviors - Vertical Magazine - The Pulse of the Helicopter Industry". verticalmag.com. Retrieved 27 April 2015. ^ "City of Chicago :: Operations". cityofchicago.org. Retrieved 27 April 2015. ^ "4 Tips for Getting Tethered Safely - SDI - TDI - ERDI". tdisdi.com. Retrieved 27 April 2015. ^ "Chicago News". ABC7 Chicago. Retrieved 27 April 2015. 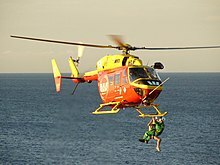 Wikimedia Commons has media related to Air-sea rescue.